I absolutely adored the cupcakes we had for our Halloween party recently, they’re squidgy and moreish thanks to the wonderful winter spices and the cinnamon icing might just be the best thing ever! 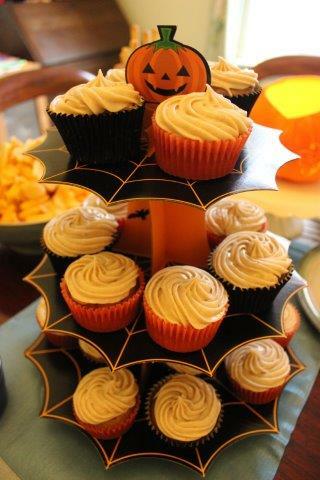 Today I’m going to share the recipe for Spiced Pumpkin Cupcakes with Cinnamon Cream Cheese Icing. First cream together the white sugar, brown sugar and butter until light and fluffy. Then add in the eggs one at a time mixing thoroughly. Now stir in the milk and pumpkin puree until combined. Sift the flour, cinnamon, ginger, nutmeg, ground cloves and allspice into the mixture. Fold the flour into the mixture using a large spoon until just combined. Now fill 23-24 cupcake cases or approx. 15 muffin cases with the batter. Bake in a preheated oven 180C/350F/Gas Mark 4 for about 20 minutes. The trick to cream cheese icing is not to over mix, if you do you’ll end up with a delicious runny icing but it’s no good for piping on a cake. Either use an electric mixer on low speed or mix by hand. Mix together the butter and cream cheese until just combined. Next add in the vanilla extract and cinnamon. I haven’t put a quantity for the icing sugar because I think it’s better to test your icing by taste and texture. Add icing sugar and mix gently until you like the sweetness and your icing can hold together sufficiently to be iced onto your cooled cupcakes.